The sign mounted on top of the Grand Lake Theater is the largest rotary contact sign west of the Mississippi River. It measures 52 feet high by 72 feet wide and consists of 2,800 colored bulbs and was designed by Theodore Wetteland. The firing sequence is controlled by a device much like a music box. The sign is typically lit Friday and Saturday, from dusk until the start of the last show of the night. The display goes through two sequences, one with red lettering, and includes a simulation of fireworks. It's an eye catching display, to be sure. 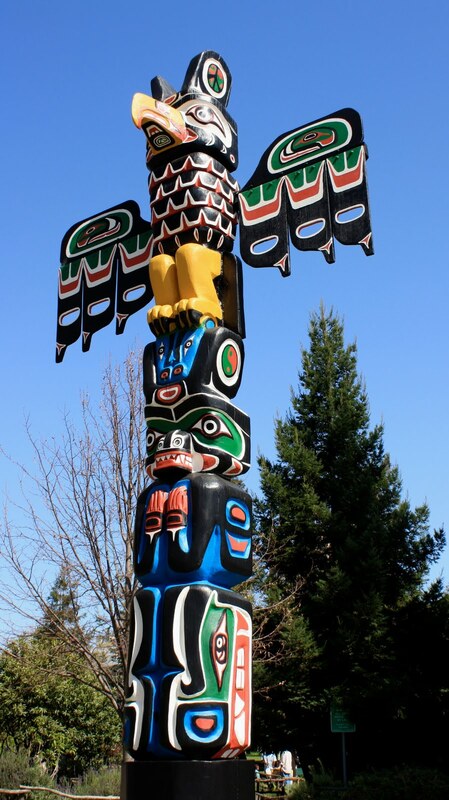 This totem pole is located at Lake Merritt. It is one of many interesting sights and activities that are housed along the three miles of shoreline. The Park Street bridge which links Oakland to Alameda. View other Sunday bridge photos at San Francisco Daily Photo. An evening shot of the Lake Merritt pergola. Same location as last week's Reflection. For more Weekend Reflections, click here. On Beacon Street just south of the Lake. This area is full of lovely, old apartment buildings from the 20s and 30s. This apartment sign meant something special to the landlord, but the meaning is now lost. I love old cast iron figures. 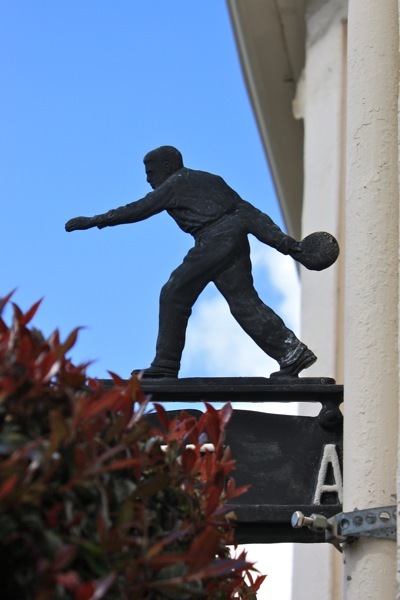 You can see behind the bowler that the sun is shining. The fair weather has returned just in time for the Oakland Marathon on Sunday. To check out other Skywatch offerings, click here. This Seventh-day Adventist church is located on Grand Avenue very near the Lake. I could find no information about when the church was built. I liked the shadows cast by the afternoon sun. Spotted on Broadway near 20th Street. This building has a minimum of three different advertisements on it. In January Sydney Eye did a cool series on these kinds of ads. They are like portals to the past. These will be completely obscured when the trees leaf out. In the 30s and 40s many Oakland neighborhoods had their own small movie theater. Over time, the movie distribution business changed and big multiplexes became the way to go. There are only a couple of small movie houses left in Oakland. So what happens to good, unused buildings? They turn into grocery stores, other retail shops, and churches. 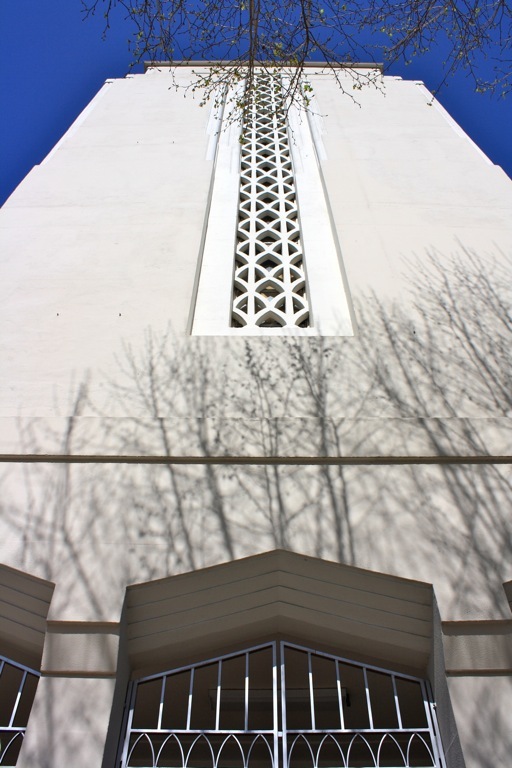 This one is located in East Oakland on Foothill Blvd. and Fairfax Avenue. You can see where the light bulbs used to be in this marquee. 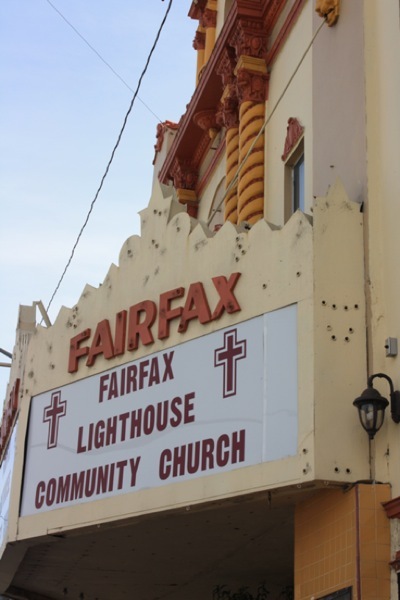 East Oakland has many storefront churches. In fact, this block alone has three. It was such a fine day yesterday that like hundreds of other Oaklanders, I was drawn to the Lake. This portal and pergola are at its eastern edge near the Grand Lake Theater. I think boats used to dock here, hence the nearby street's name of El Embarcadero. The landscaping around the lake is being upgraded so they've recently laid new sod in this area. Lots of people were sitting outside catching the rays. For other Weekend Reflections, please click here. Spring is in the air. With no rain and shirt sleeve weather, we are definitely happy campers. While walking around the lake today, I spied a Segway tour. Who knew? You can also see that there isn't a cloud in the sky. 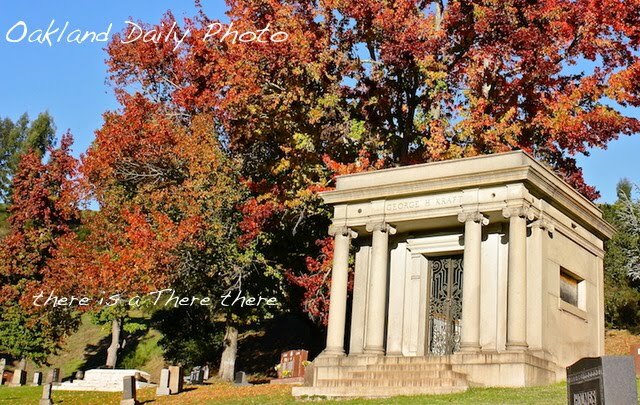 For other Skywatch Friday photos, click here. 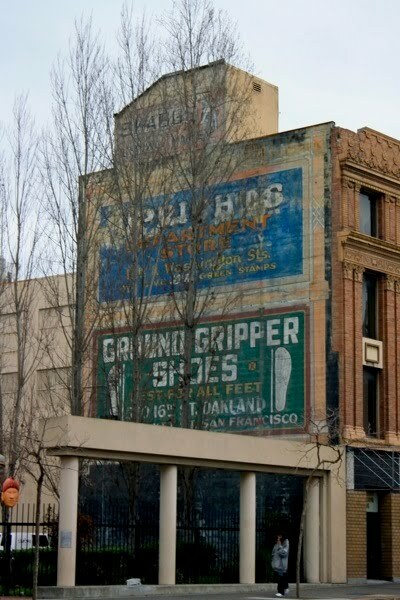 I've always liked this old sign. It's on MacArthur Blvd. just on the other side of the freeway from Mills College. Back in the day, MacArthur was a main thoroughfare through town and there are still lots of old motels along it. Most seem to be residence motels now. I imagine some even rent rooms by the hour, if you get my drift. It's a modern miracle that signs like this have survived and are still in working order. 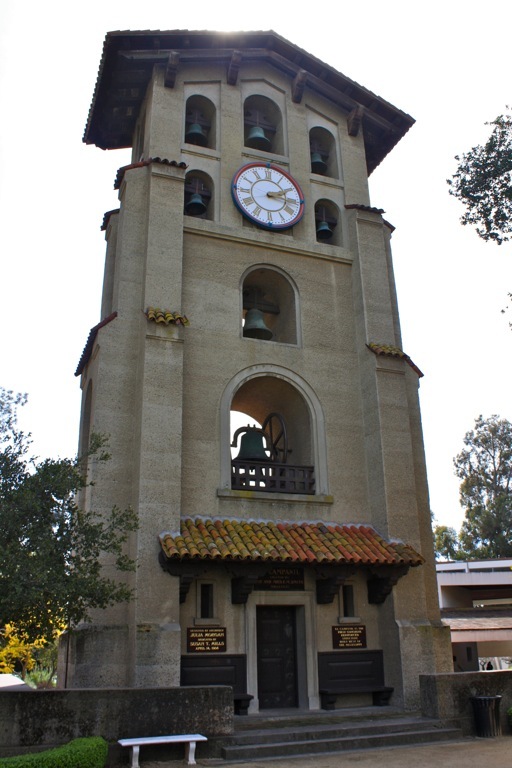 This bell tower was designed by Julia Morgan in 1904. It is the first reinforced concrete structure built west of the Mississippi. It sits on the 135 acre campus of Mills College, the oldest women's college west of the Rockies, and a true oasis in its urban setting. 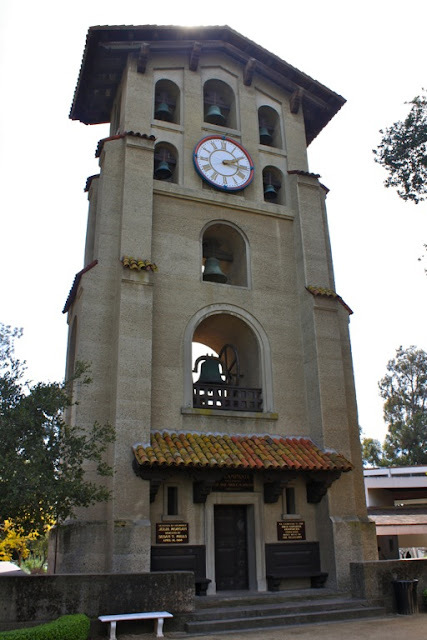 This campus is located in the middle of Oakland, bordered on the east by the 580 freeway. It is a verdant setting full of redwoods, eucalyptus, pine, and laurel trees. Lion creek runs through the campus on its way to the bay. Many of the buildings are in the Spanish style with stucco walls, terra cotta tiled roofs, and wrought iron accents. The art museum is open free to the public. 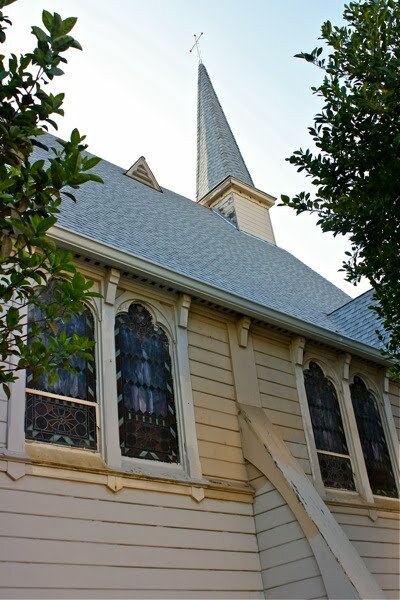 St. James the Apostle is an Episcopal church founded in 1858 by the first Episcopal bishop of California. The building may be the original on the site here in the San Antonio district and is old by Bay Area standards. It's one of two churches in the neighborhood with tall steeples. Masses are still offered three times on Sunday, one in Spanish. This large Victorian Italianate building still holds court on International Blvd. and 13th Avenue. This style was popular between the 1860s through the 1890s. It's hard to tell whether or not this was originally a single family dwelling. It now functions as a retail store with apartments above. If you look carefully, you can see a little boy looking out the corner window. This is one of hundreds of Victorian era structures still in use in Oakland. Weekend Reflection: grain elevators in Oakland? Almost, but not quite. This is the ConAgra flour making plant situated on the Estuary near the Park Street Bridge. One of several industries still located on the Estuary. The area is slowly being transformed by the condos that are being built along the water. This view is looking northwest towards Jack London Square and a more formal marina. For other Weekend Reflections, click here. It's been raining all day and this evening the weather is finally breaking up. 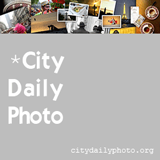 Click here for Skywatch photos from around the world. 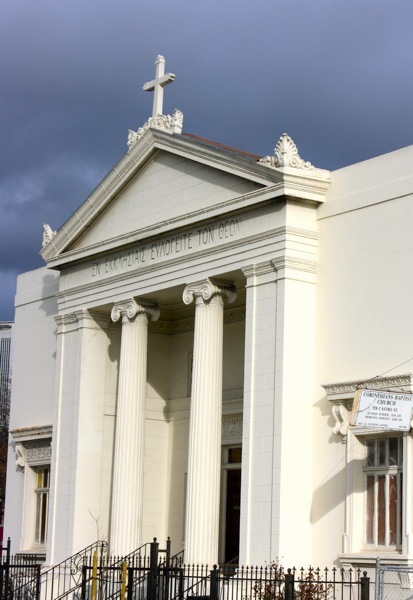 This Baptist church occupies the former original Greek Orthodox church that was on the site from 1921 to 1960. 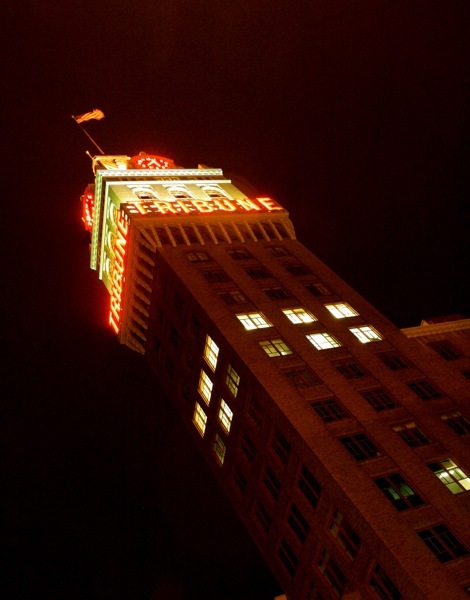 This graceful structure located on Castro Street on the edge of downtown Oakland now faces the 980 freeway. This and an accompanying mural are found on Mandala Parkway and 20th Street. It was designed by Desi, an Oakland street artist, as part of a summer program with West Oakland youth. It is not readily apparent, but the "canvas" is an old railroad car placed on railroad ties. I understand this is not everyone's cup of tea but it is something to consider. You may argue whether or not it's art, but I don't think of it as a blight like tagging. The Grand Lake Theater has been located on Grand Avenue since 1926. Over time it has developed into a small multiplex and also houses a display of antique projection equipment. Two days a week they turn on the big rooftop sign made of hundreds of light bulbs, the largest west of the Mississippi. (A photo of this sign will be featured in a later post). Mondays through Thursdays they offer discounted tickets and free popcorn! 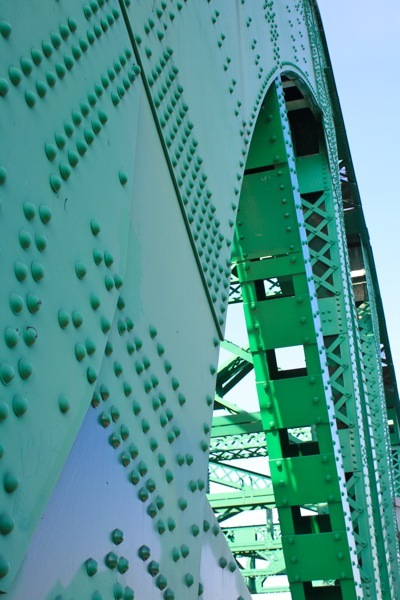 A view of the Fruitvale Bridge from the Park Street Bridge. As you can see, the Estuary still has some industry along its shore. But the water is always beautiful to look at. For more Weekend Reflections, click here. This photo is brought to you courtesy of those wacky guys at Automania. I'm pretty sure they're all Desotos parked in a row eight feet above the sidewalk. This partially blue sky was around earlier in the day; but it's now gray and threatening rain. So it seems to go recently. We still need the rain, so I'm not complaining. For more (and better) Skywatch photos, click here. Smitty's is an old time watering hole on Grand Avenue just east of Lake Merritt. It has always drawn a wide age range of clients. This is the place if you like a good game of bar shuffleboard. 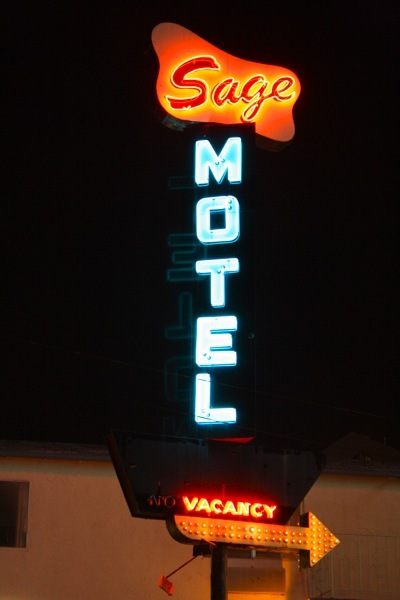 Hope to post other old neon signs over the next several weeks.